SUMMARY: Aetna's Compassionate Care Program, a case management program that targets patients with advanced illness, has had an enormous impact on the number of inpatient stays, average length of stay, ER visits, ICU days and hospice selection rate for the patients it serves, according to a study published in the Journal of Palliative Medicine. We wanted to learn how Aetna identifies members with advanced illness for this program. Joseph Agostini, MD, senior medical director of Aetna Medicare. "We have a claims-based algorithm that helps to identify and predict members using diagnoses that we know about and other informational data to identify patients with early to mid-stage advanced illness. Therefore, we can reach out to them and engage them early in the process. Not everyone has an identifiable condition prior to end of life, and the algorithm is never 100 percent, but it helps us create a cohort of patients who we know are in need. Health plans, and certainly most clinicians, should be able to construct a list of diagnoses and diseases that may be used to identify a potentially eligible cohort who would benefit from services in advanced illness care." 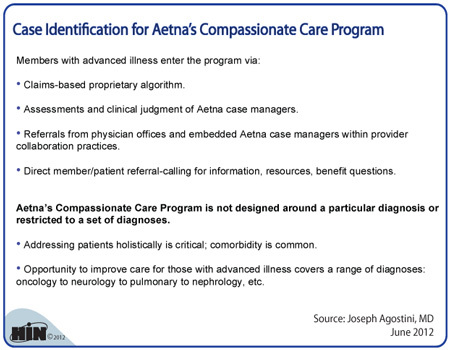 During this webinar replay, Dr. Joseph Agostini shares the key features of the Compassionate Care Program at Aetna, along with the impact the program has had on healthcare utilization and quality outcomes. Advanced Illness Care Coordination: A Case Study on Aetna's Compassionate Care Program is available from the Healthcare Intelligence Network for $129 by visiting our Online Bookstore or by calling toll-free (888) 446-3530.